Join Lisa for this deeply nurturing yin workshop offered in the Autumn season, a time which encourages an enriching inward focus whilst surrendering old outdated ways of being. Like the leaves on the trees that become brittle and fall away, we too can gracefully and elegantly shed that which no longer serves us. We are invited to move beyond our limiting self beliefs and to give ourselves space and time for the unfolding of wisdom whilst embracing an enhanced capacity for love, compassion and patience. Explore the yogic teachings of Ahimsa (often translated as non-harm, non-violence) through discussion and sharing of insight. Be guided through an extended yin practice releasing deeply held patterns through delicious long holds purifying and detoxifying the body, mind and breath. The intention of this offering is to invite us into drop into our natural capacity to be aware, and therefore conscious of how we cause suffering, to ourselves and to others, when we disconnect from our empathic or sensitive selves. By giving back to ourselves we restore and replenish our inner resources of love, patience and generosity enabling us greater capacity to hold space compassionately for others who may be deep in their suffering. All are most welcome. We are super excited and blessed that two members from the renowned Raju family will be visiting Australia this May. Brother and sister, Vaidya Krishna Raju and Vaidya Padma Raju, come from a long line of distinguished Vaidyas (Ayurvedic physicians) going back for generations on both the mothers’ and fathers’ sides. In this very special interview-style event, you will gain an insight into ways to enliven and intervene with the subtle aspects of the human physiology which are the root foundations of health. This is where profound prevention, treatment and biological intervention occurs. You will learn simple and powerful practices that you actually enjoy doing! Practices and techniques to implement yourself in order to trigger these potent innate healing mechanisms within you. 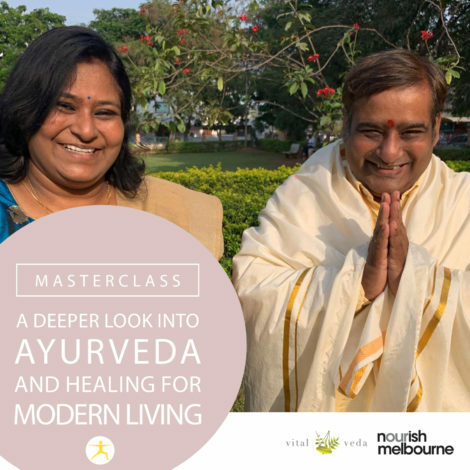 No matter your understanding of Ayurveda, unfamiliar or advanced, this will reveal a fascinating window into this body of knowledge and its power to deliver balance in modern life. The Raju family are masters in pulse diagnosis and specialists in creating individualised treatments using rare and powerful herbal formulas. They have experience and success in treating a full range of diseases, from prevention to the seemingly incurable, and will also be offering private health sessions, the powerful Banana Purification for women and workshops while in Sydney, Newcastle, Melbourne and Adelaide this May. This very special event is co-hosted with Nourish Melbourne and Vital Veda.